expression of enthusiasm for peace and art! visions for a more peaceful future. and organization of the event. CHALK4PEACE - YOU made IT Stratospheric! statement about peace more permanent is positively wonderful. become an annual event for many. peace is a compelling and necessary part of their present and future. by email…more than 1,200 so far. If you had an event, we’d love to see it. the events that happened this month around Planet Earth. You are MIGHTY...you are CHALKSTARS! since CHALK4PEACE began on September 14! Thanks 4 all your enthusiasm! Next year's CHALK4PEACE is scheduled for September 19-21, 2008. 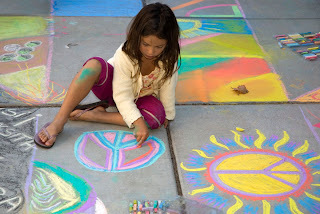 CHALK4PEACE is all over your sidewalk! were represented with drawn flags and symbols at the OAS. mark was just under 500.
on Friday, only to be washed away by the evening's storm. beautiful job of transforming their parking lot into a giant canvas. Cork City, Ireland and Bethlehem, Israel. They will appear at www.chalk4peace.org in the coming weeks. Several California events have already been posted. led to CHALK4PEACE. The above photo is by Jerry Downs Photography. CHALK4PEACE has already begun...CHALK ON! Planet Earth is NOW being painted the colors of peace. 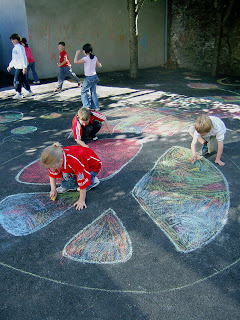 two classes a day to chalk their visions in the courtyard. It is their second year participating in CHALK4PEACE. The public is invited in on Saturday to see their efforts. Talk about unbridled enthusiasm! We can't keep up! They are officially the first site of CHALK4PEACE 2007.
peace seems to be breaking out everywhere!" at the Valley View Elementary School in Richmond, CA. The entire school is expected to join in. We're receiving numerous conformations of new sites daily! Cork, Ireland and Lima, Peru are two new locations! your information source for CHALK4PEACE. CHALK IT UP 4 PEACE! Rain or shine! Kids don't care. Don't forget to take photos for the global portfolio! We're doing our best to keep up with global enthusiasm! 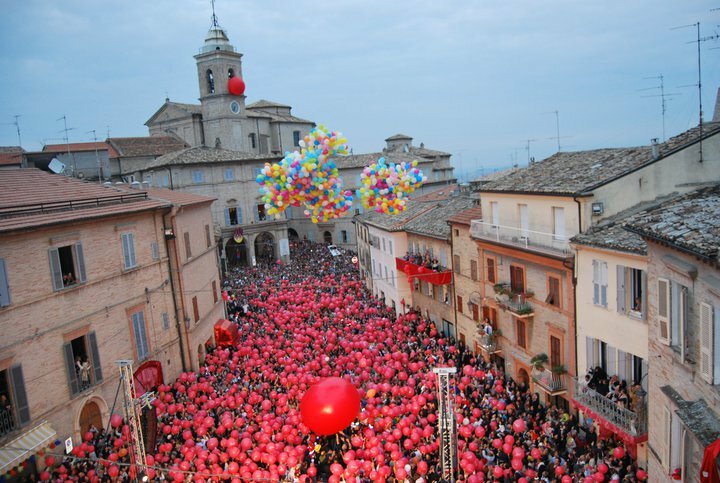 as one hundred or more young artists on a playground! Let's see those peace symbols as big as a football field! Envision one thousand sites around the world! Bless you all 4 your part in CHALK4PEACE. It's like nothing you've ever seen..
unless you did it last year! 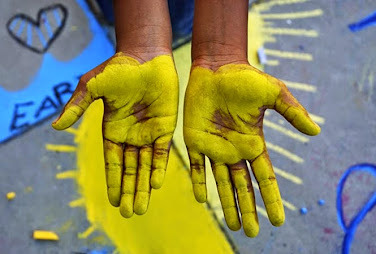 when we paint the planet the color of peace.